Jerald Foster has always been a responsible guy. Just ask his brother Trey. A big part of why the two never lived together in college was because they could never agree on house cleanliness. It was better to stay apart. Foster now lives with seniors Mick Stoltenberg and Luke Gifford, as well as redshirt freshman Kurt Rafdal. And like any house filled with roommates, someone has to take responsibility for the rent and bills. In this house? 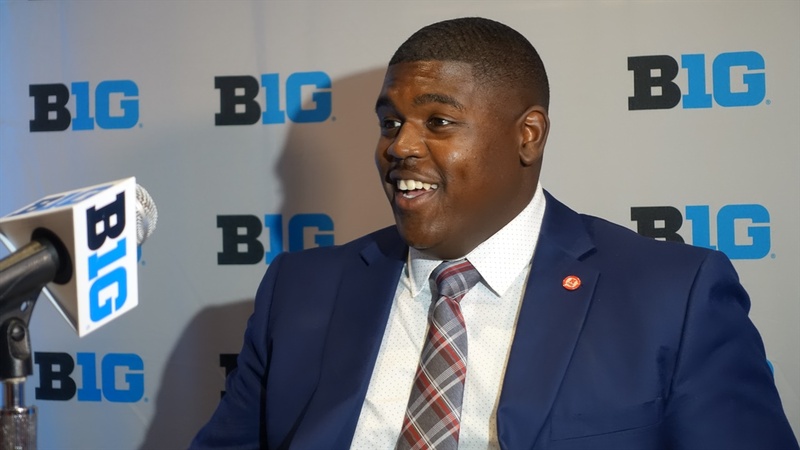 "I'm the house dad," Foster said at Big Ten Media Days. Stolternberg isn't so sure that's how he'd define Foster's role, though. "He's the finance guy in the house, so he's always coming at us for bills. Every house needs it," Stoltenberg said. "But I wouldn't call him the house dad. He's more like the government of the house. It's the necessary evil. "He's just there to make sure everything is in order." Part of keeping everything in order is collecting rent. While it's gone off without a hitch most of the time, there was a four month period that was anything but smooth between Foster and Stoltenberg. Rent is $375 per person in the house. Stoltenberg came to pay Foster, but arrived $10 short. When Foster corrected him, Stoltenberg assumed his roommate was trying to pull a fast one on him. "He said it was $375 and I said, 'Dude, it's $365. It's been that since forever,'" Stoltenberg said. "He literally had to show me ... I don't even remember what he had to show me to prove it." It was a text message. After a bit of back and forth, the duo settled on the correct rent agreement of $375 and moved on. Until the next month, that is. "For four months straight, he kept giving me $365 and I'd say, 'That's $10 short,'" Jerald said. "We would fight for at least 20 minutes, so I'd tell him to check his text messages and he would check it." Stoltenberg doesn't believe it was a serious fight for all four months. At some point, it became a running joke between the two. Stoltenberg joked Foster was just hustling him out of extra money, and Foster joked Stoltenberg was just trying to lower his rent. "It was just a brain dump. I don't know why I thought my rent was lower," Stoltenberg said. "Now it's a running joke every time he hits us up for utlities and rent that we're just throwing away money and adding it to Jerald's investment fund. He's just stockpiling all of our cash and putting it somewhere." Being the guy in charge of the finances, Foster welcomes his roommates to tackle the monthly rent and bills in his place. He wouldn't mind the break. "I'm the only one that goes to our landlord," Foster said. "[Mick] would say, 'I don't know how much the bills are for electicity and stuff.' I was like, 'You can pay them. You pay 'em and then you'll know what it is.'" Foster and Stoltenberg laugh retelling the story now. Foster calls Stoltenberg a "dummy" for what happened. Stoltenberg dishes it right back. That's how the duo makes things work, after all. While things are now peaceful, Rafdal is moving out of the house in August. Only time will tell if the new roommate can tackle the rent situation seamlessly or not. For Foster's sake, he hopes so.